ImTOO iPad Mate is an all-in-one application for Apple iPad tablet users to backup iPad movies, music, ebooks, messages, contacts, apps and photos to PC, export media files from PC to iPad, and transfer iPad to iTunes as an iPad transfer. Moreover, the iPad Mate can convert CD/DVD, ISO images, IFO folder, videos and audios on your computer to iPad movies and music as a DVD to iPad converter, read and export pictures/videos recorded by the device and work as an iPad video converter. Not only can you transfer and backup media files among iPad, iTunes and PC but also manage, organize and edit iPad media files with this iPad manager software. You can edit track information, search files, preview DVD movies, videos and audios, and so on. Fully support iTunes 12.0 and all iPad models and other Apple portable devices, such as iPad, iPad mini, iPad Air, iPad Pro, iPod, nano, iPod mini, iPod shuffle, iPod classic, iPod touch, iPhone, iPhone 3G, iPhone 3GS, iPhone 4, iPhone 5S, iPhone 5C, iPhone 6, iPhone 6 Plus, iPhone 6S, iPhone 6S Plus. Import or export movies, music, photos, ebooks, messages and apps between iPad and your computer without iTunes. You can also copy photos from photostream to PC. 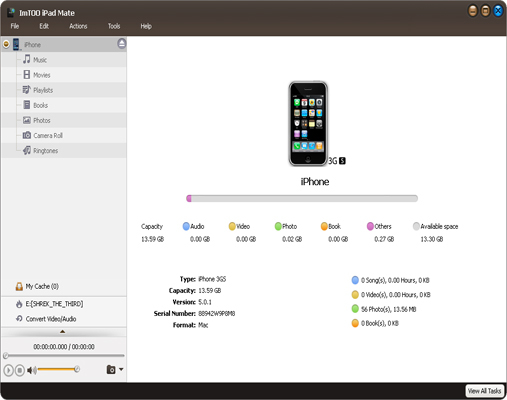 Transfer your movies, songs and playlist from iPad to iTunes library, read and export pictures/videos recorded by device. Fully supports iTunes 12. Help you convert CD and DVD movies to iPad, and convert ISO images/IFO folder to iPad supported formats. Transfer application between PC and iPad by dragging and dropping, also support to manage application document. Import and export contacts for iPad and other Apple devices like iPhone, iPod Touch 4, iPod Touch 5. Import contacts from many Address Book programs, e.g.incredimail. High compatible with all iPad models and other Apple portable devices: iPad, iPad 2, iPad 3, iPad 4, iPad mini, iPad mini 2, iPad mini 3, iPad mini 4, iPad Air, iPad Air 2, iPad Pro (12.9/9.7/10.5 inch), iPod, nano (5th Gen), iPod mini, iPod shuffle, iPod classic, iPod touch, iPod touch 4, iPod touch 5, iPod touch 6, iPhone, iPhone 3G/3GS, iPhone 4, iPhone 5/5S/5C/SE, iPhone 6/6 Plus, iPhone 6S/6S Plus, iPhone 7/7 Plus, iPhone 8/8 Plus, iPhone X, iPhone XS, iPhone XS Max, iPhone XR. Don't have to bother to search for your data connection cable in case it is misplaced ImTOO iPad Mate supports data transfer via Wi-Fi. Automatically identify your iPad and show its model, capacity, serial number, type and format. Edit and fill in ID3 information including name, artist, album, composer, and year. Find your files with quick search or according to genres, artists, songs and albums. Backup and transfer movies, songs and photos between iPad tablet and your computer without any limitations. Allow you to connect iPad, iPhone and iPod touch simultaneously and transfer batch files among them. Load your favorite videos or audios and the iPad tools will automatically convert them to iPad supported formats. The input files supported: M2TS, MTS, AVI, MPEG, WMV, DAT, TS, MPV, NSV, MOV, QT, H261, H264, WMA, AAC, AIF, AIFF, AC3. Multilingual languages are supported, including English, German, Spanish, Italian, French, Traditional Chinese, Simplified Chinese and Japanese. Tips: How to put videos, movies on iPad? Convert Videos and home DVDs to iPad plus transfer music, photos, and movies between iPad and PC. Backup iPad movies and music to iTunes library, read and export pictures/videos recorded by device.